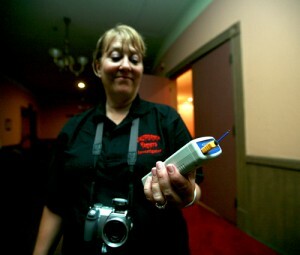 Slamming filing cabinets, falling handtrucks, electronic voice phenomena, pushing, and bruising are among the interactions Sacramento ghost hunters California Haunts has experienced with the dead-but-not-gone. Lead investigator Charlotte Kosa and her associate Rose Coibion are among a handful of paranormal investigative teams peppering the Gold Country. Unlike the ‘Professional’ paranormal investigators on the Syfy Channel’s Ghost Hunters, Kosa and Coibion do this strictly as a hobby. “My mother goes out with us,” beams Kosa. Kosa and Coibion allowed me (and intrepid MidMo photographer Scott Duncan) to tag along on a lunchtime quest to suss out spirits at the Woodland Opera House. With them on the scene were a psychic, Trish Flores, and two women who set up video cameras and motion detectors, and utilized digital voice recordings to look for electronic voice phenomena, as well as took electromagnetic readings. They each toted digital cameras and took frequent snapshots when the psychic sensed a presence in hopes of capturing its spectral image. An intricate web of tangled wires sprawled the length of the creepy, albeit lovely, old place, and relayed several video reels back to a monitor at the back of the auditorium. 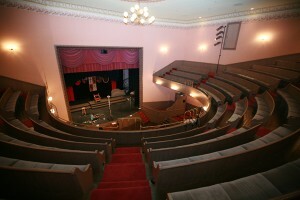 Two or three spooks are rumored to haunt the old Woodland Opera House. William Porter legitimately did die on-site. He was a firefighter who went down in the line of duty in 1892 while protecting the local entertainment landmark. Rose claims that he is angry because the arsonist who initiated his death never did pennance for his crime. Porter, according to the psychic, is also angry because theater thrives in his place of torment; “It’s not a show,” he wants us to know. Then there’s Madam Macheska, an actress who can’t stop eating up the limelight. 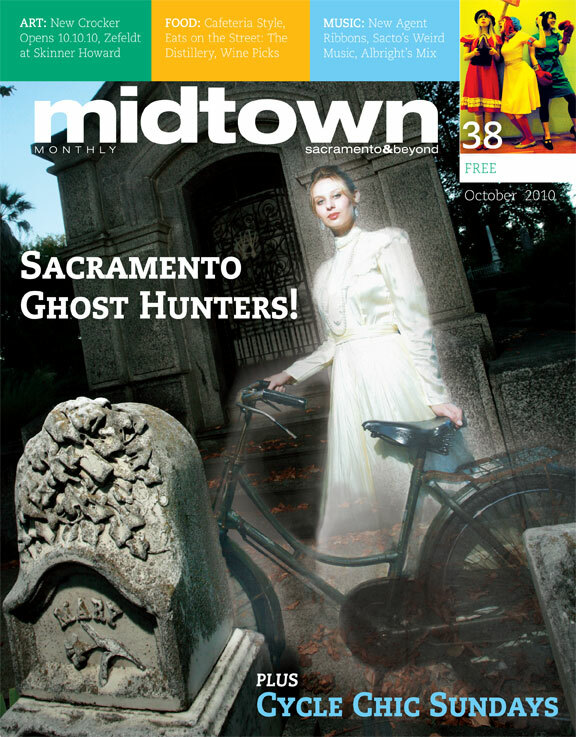 She’s a haunt-hopper, according to Charlotte, who also haunts at the Sacramento Theater Company. And, last, there’s a deceased stage manager whose supernatural being won’t leave the opera house because he’s a control freak still seeking to grant or withhold approval of every production. He is said to hover from the balcony menacingly, arms crossly folded, and a few Woodland Opera House actors have claimed to see him grimacing aloft. 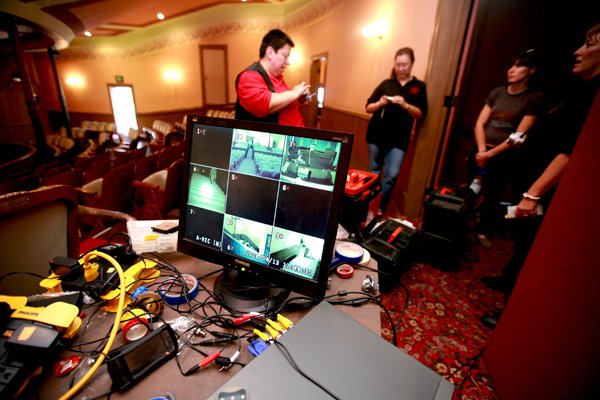 The cameras were a pain to network into place, and of course the team alluded to ghost-marauding as the culprit. I took the opportunity to explore the historic site – including a precarious ascent to the catwalks. This side adventure proved a nerd’s delight: plexiglass shields a myriad of preserved relics, including ancient event advertisements, and handwritten scrawlings from actors on the dressing room walls, some dating back to the early twentieth century. While I was pursuing my nerdery, the investigators were occupied with recordings and readings. I joined the psychic on the upper level, which she had designated as a hot spot of paranormal activity when she first entered the building. As we climbed the stairs, she noted, “You see how the air feels thicker, hotter up here?” She described the man she envisioned there as having a handlebar moustache and slicked-back, dark hair. She also kept repeating a caveat, “I’ve never been here before! It’s so cool!” to each person within earshot. When we were led to the basement, which bore Bill Porter’s portrait, her description turned out to be spot on, and I wondered if she really had never seen his picture before. After the madam had apparently departed Scott reviewed some of his own shots. His demeanor changed as he noticed something blurred and other-wordly walking up the basement stairs in a photo he’d taken of the split-screen monitor in the auditorium. It was a feminine figure emerging from the basement in a white dress, and the image didn’t seem to be made of of flesh and blood. For the first time since we’d arrived, the hair on the back of my neck stood up and I started to wonder if we’d actually captured Madam Macheska. Then Scott recalled that one of the video camera ladies had been wearing a white skirt, and after brief questioning we ascertained that she’d been checking a motion detector on the stairs when Scott took the picture. The hair on the back of my neck went slack again. Back in the basement, flanked by dressing rooms, and centered in a circle of sofas, the paranormal investigators were attempting to communicate with the dead with dying flashlights. They asked the Madam questions and then attempted to extrapolate meaning from the flickering brought on by the diminished batteries. Spirit activity can kill batteries almost immediately, we were told. At this point it was time for the MidMo crew to head back to Sacramento. As Scott and I packed up our stuff, Kosa and Coibion expressed their regrets that we wouldn’t be able to join them for a late-night haunt-hunt before deadline, which, they assured, would likely produce more fruitful results. With one last wave to the Madam and her unseen friends, we trooped up the stairs and out into the world of light. If you want to go on a ghost hunt, go to http://www.meetups.com/californiahaunts for monthly meet-ups, or check out their streamed or podcasted rant, http://www.blogtalkradio.com/californiahaunts, weekly. 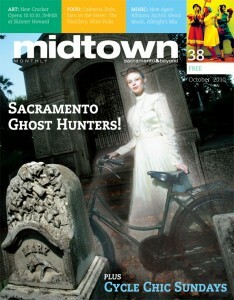 Their website permits contact if you’re hampered by a ghost: http://www.californiahaunts.org. I just want to set the record straight on a couple of mistakes in this article. First of all, the psychic’s name is not Karen. It is Trish. Also, the evidence with the flashlight turning on and off on its own does not depend on dead batteries. It occurs with fully charged batteries which we had in our flashlights that day. This technique is used by a lot of investigators and often brings results. Also, there were a lot of problems with setting up the cameras that day, which was odd. We had no problems the next night at our following investigation. Just maybe we were right about “ghost marauding” being the cause. California Haunts is a professional team. We just don’t get paid to perform on TV. I have the propensity that you are looking for. I am very gifted. Please email me if you would like to meet. I would love to join you guys. It’s October my favorite time of year. .